This is a story about Jack and Diane, two American kids who hiply strolled through life assuming America was responsible for every meaningful aspect of modern existence as they cracked very funny jokes about how lame the British were for their terrible food and generally not having any accomplishments worth boasting about -- except of course their precious accents and providing fodder for American television shows that lasted way more seasons than the British originals anyway, and so must be way better. One day though, Jack and Diane’s world was invaded by terrifying little notes of mysterious origin, advising them that many of the inventions they’d believed to be red, white, and blue, were actually red, white, and blue of the Union Jack persuasion. 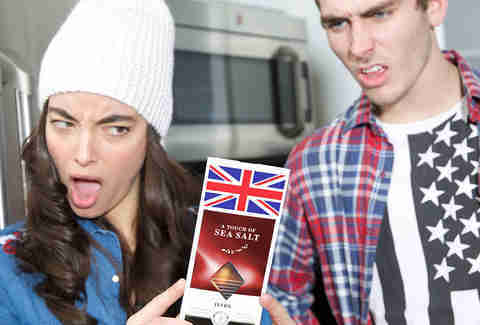 Their horror deepened as the true nature of everything they’d taken for granted revealed itself, and they slowly realized that you can’t escape the British. A firm believer that Americans have the best dental hygiene in the world, Diane has just turned to remind Jack to brush for a full 2 minutes when an ominous message appears in the bathroom mirror’s fog. Jack stares in disbelief, but the mirror doesn’t lie: the prototype for the world’s first mass-produced toothbrush was invented by the Englishman William Addis in the 1770s. Addis had been jailed for “starting a riot”, and found the traditional prison method for cleaning teeth -- a rag -- to be ineffective. So he asked the most cooperative prison guard in history for some pig bristles, then wedged those into holes he’d drilled into a small bone he’d saved from the very dinner whose remains he now wished to remove from betwixt his chompers. What was the riot about? Nobody seems to know. Why did an imprisoned Addis have access to a tiny drill? Uncertain! What is clear, though, is that Jack is officially freaked the **** out. 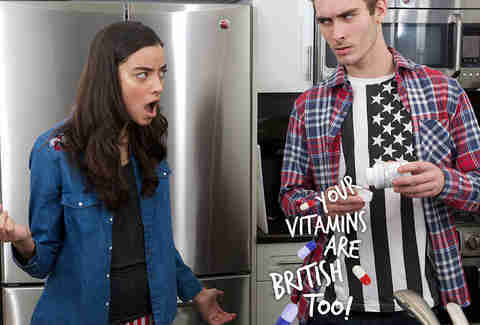 As another message spills out with Jack’s daily supplement, Diane is furious. “I don’t know what makes me angrier, that you wasted money on a Learning Annex magic course, or that you’re trying to tell me vitamins weren’t invented by GNC. Pittsburgh. Pennsylvania. America.” Sorry, Diane: Jack did take a Learning Annex course, but it was called “Discovering and Recovering Your Creative Self”. And vitamins were first discovered by Nobel Prize-winning Cambridge biochemist Frederick Gowland Hopkins when, in 1912, he made a brilliant deduction after force-feeding some mice a diet of carbs, fats, and proteins. Well, not force-feeding -- they loved it! But they were also very unhealthy mice. Their worldview rocked, the couple searches the Internet in an attempt to debunk these pernicious lies. Apparently during the 2012 London Olympics they were too busy making snide comments about the Spice Girls reunion to notice the ceremony honoring England’s Tim Berners-Lee as “the inventor of the World Wide Web”. 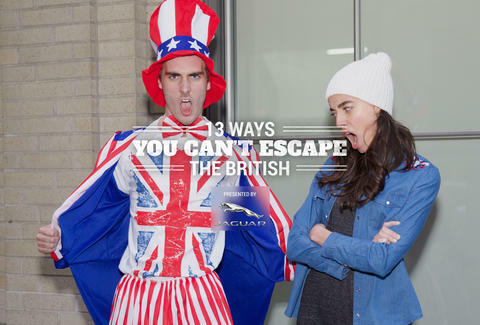 There’s no distress a bit of shopping at American Apparel or American Eagle can’t cure. Unfortunately, no matter the goods they purchase, the plastic bag they’re packaged in owes its existence to polyethylene, discovered in 1933 by Reginald Gibson and Eric Fawcett of Imperial Chemical Industries in Cheshire. Is that a mischievous grin on Jack’s face? No, it is not. En route to brunch, Diane appears shellshocked and Jack looks as if he’s stumbled on a pile of rotting fish as the mystical text apprises them of Full Size Bike With Tiny Wheels’ birthplace: Bradford-on-Avon, 1962, fathered by engineer Alex Moulton -- shocking, because FSBWTWs really do look like they just suddenly materialized one morning folded up in the tiny closets of Williamsburg studio apartments. Not even brunch is safe! Of course all modern agriculture owes a tremendous debt to Berkshire’s Jethro Tull, inventor of the seed drill and the horse-drawn hoe (come on Diane, can you imagine how expensive that salad would be if those greens were hoed without the use of a horse?). More earth-shattering is the revelation that a forerunner for lasagna, “loseyns”, was included in an ancient British cookbook called The Forme of Cury way back in 1390. 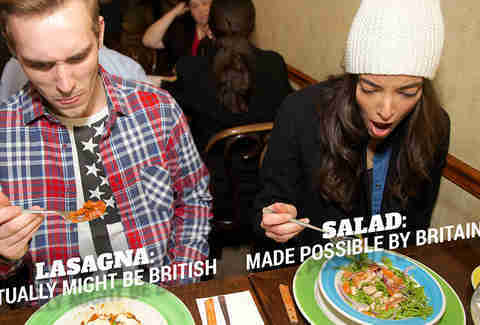 Jack is infuriated that what he thought was an Americanized version of an Italian dish might actually be an Americanized version of an Italianized version of a British dish. Diane is just, like, wha? Aqualung? Unable to finish their meals, Jack and Diane reach for a reliably American snack, the chocolate bar. It is American, right? Who else but our proudly overweight country would take a hunk of chocolate and mold it into a bar that could be eaten by hand? Joseph, Francis, and Richard Fry, that’s who, in 1847, though it wasn't until 1866 that their Bristol (English Bristol, not ESPN Bristol) factory unleashed the game-changing “Fry’s Chocolate Dream Bar”. As Merlin said in Excalibur, "a dream to some, a nightmare to others!" Still famished, the distraught duo gets ready for a disco party. Disco was born in Philadelphia, home of the Liberty Bell and Vince Papale -- surely this is safe ground? Not so fast! People who discoed didn’t wear pants made of beaver trapped by mountain men, they wore polyester, and the first polyester fiber (fibre?) was produced by Englishman and eventual Commander of the Order of the British Empire John Rex Whinfield and his assistant James Tennant Dickson. Don’t worry J&D, you will survive! 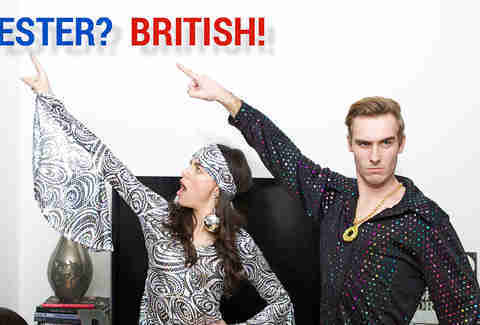 Later, still donning their British-invented threads (because what else could you possibly wear to a disco party? ), Jack and Diane are confronted by identical replicas of themselves. Their minds are first blown by the coincidence that both themselves and their replicas were friends with the party's hosts back at Penn. Then their minds explode all over again when they're reminded that the first mammal cloned from an adult cell, Dolly the Sheep, was ushered into this world by Ian Wilmut and his team at the Rosling Institute, just outside of Edinburgh. Come on, guys, you should know this one -- it was all over MTV News in 1996! Okay, fine, the first corkscrew patent was awarded to the Reverend Samuel Henshall of Oxford, big whoop, who cares... except of course anyone that wants to open something that's been corked. No, Jack's enthusiasm doesn't match that of the International Correspondence of Corkscrew Addicts (ICCA), who several years ago presented a delightful plaque to London's Bow Church, where Henshall was a rector. But he's not going to insist on sabering that bottle open, either. The thing with clones is, they look an awful lot alike, and Jack can't necessarily be blamed for attempting to show a little affection towards Diane's lookalike, Dianne. Diane warns Dianne that she'll most likely catch something not very enjoyable if she continues to mess around with Jack, which isn't true because, despite his Anglophobia, Jack's actually a pretty decent guy, but just in case, isn't it nice that in 1920 Alexander Fleming of London's St. Mary's Medical School first noticed the mold that would soon produce the world's first antibiotic? Well, this is a sad development. 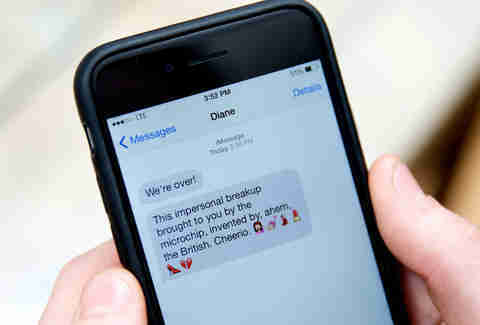 But at least the breakup was accomplished with the utmost efficiency thanks to electronics engineer Geoffrey William Arnold Dummer of Hull, inventor of the integrated circuit, aka "the microchip". 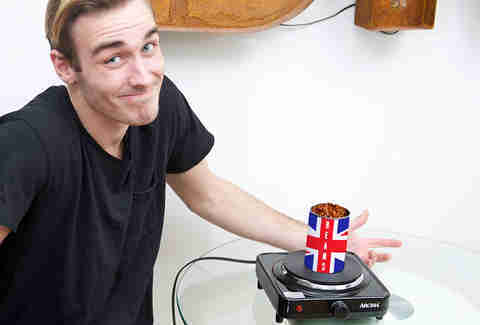 Finally accepting of British omnipresence in his life, Jack sits down to the most depressing possible post-breakup meal: a tin can of beans. 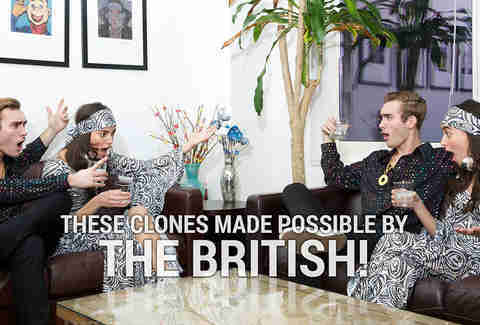 Naturally, the can itself was first patented in 1810 by Londoner Peter Durand. Jack can take solace in the probability that the can opener was invented by the American Ezra Warner in 1858, though some claim the Englishman Robert Yeates beat him to it in 1855. In any event, at least Jack didn't have to use a hammer and chisel, and he can always cure his singleness by taking out a "lonely hearts ad" -- which have been popular in England since at least 1695.